The “Sevmorput” might start shuttling frozen fish along the Northern Sea Route. Russia’s state nuclear power company Rosatom eyes new assignments for its nuclear-powered container ship “Sevmorput”. In a meeting with the State Fisheries Agency (Rosrybolovstvo) and representatives of fish processing companies late October, Rosatom made clear that the “Sevmorput” can be applied for shipments of frozen fish from the Russian Pacific coast to ports in Northwest Russia. 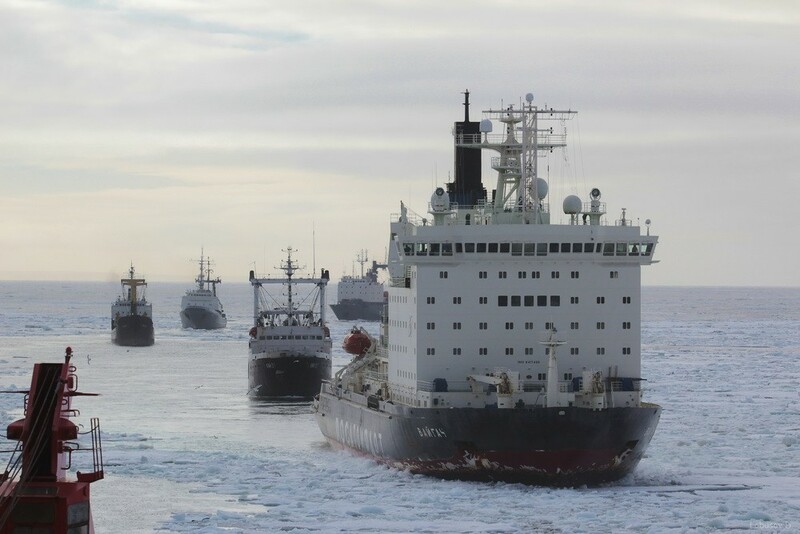 “Nuclear container ship “Sevmorput” can carry more than 1,300 contaiers and is able to independently break through 1,5 meter thick ice [and] if you colleagues support us, then there can be organized several shipments on a settled schedule in the course of 2019,” leader of company division Rosatomflot Vyacheslav Ruksha said. A joint working group with representatives of Rosatom, Rosrybolovstvo and fisheries companies will be established to elaboate on the issue, the Fisheries Agency informs. Over the last years, several shipments of frozen fish have made it through Arctic waters from Russia’s east to west. In August 2014, reefer “Garmoniya” sailed from Vladivostok to Arkhangelsk with 3,000 tons of salmon. In 2018, the shipments continued. According to company Dobroflot, it has this year successfully delivered frozen Pacific salmon to the Norebo company in Murmansk. The shipments of fish are fully competitive with foreign deliveries, Dobroflot argues. “It is becoming clear that the sharp increase in the Russian fish processing companies’ use of the Northern Sea Route will already in the foreseeable future squeeze out foreing competitors like Norway, which previously dominated the Russian red fish market,” the company makes clear. Record-big volumes of Russian Pacific salmon was caught in 2018. According to the Fisheries Agency, the catch exceeded 670,000 tons, of which about 500,000 tons were caught around Kamchatka. Parts of that catch should be provided to buyers in western Russia, the federal Fisheries Agency argues. “In order to improve the level of food security in Russia we need to develop alternative routes for deliveries of fish products from the Far East,” Deputy Head of the Fisheriees Agency Petr Savchuk underlined. “One of the alternatives is to organize a permanent shipping line for fish transports from the Far East along the Northern Sea Route,” he made clear. The 260 meter long and 61.000 ton deadweight “Sevmorput” was built in 1988, and was in the period 1992-2006 used for transportation of goods to ports along the Northern Sea Route. Later she was docked at the Atomflot base in Murmansk for years without assignments, and Rosatom was preparing to turn the ship into scrap metal. It has been believed that the nuclear-powered vessel could get a key role in the transportation of troops and military personnel to Russia’s new and upgraded Arctic bases. The ship will also be used for transportation of goods to the new Pavlovsk lead and zink mine in Novaya Zemlya, as well as for assignments for the Russian Arctic oil industry.